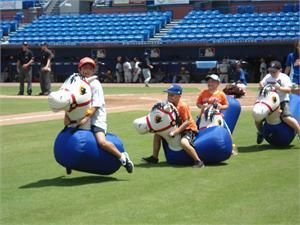 Pony Hops is a new version of the potato sack race. On Your Mark, Get Set and Go!!! You get one small, two medium and one large pony for $179. Smalls fit 3-6 year olds, mediums fit 6-13 year olds and large fit 14 year olds on up. Each pony has a weight capacity of 750 pounds.